The Glendale Community Council has taken the first step towards a community led solution to address the impact of increased visitor numbers to Glendale. Two reports have been published one detailing the levels of traffic and visitor numbers to the area, the other details the impact of the lack of public toilets. The popularity of Glendale, which is recognised as one of the most iconic and best known destinations on Skye, stems from stunning scenery at locations such as Neist Point; being home to the world famous Three Chimneys Restaurant; and Glendale’s status as one of the most important locations in terms of Scottish heritage and culture. The people of Glendale brought the land struggles of the late 19th century to the fore, leading to the establishment of the Napier Commission and subsequent formation of the Glendale Estate, the first ever community buyout in the history of Scotland. The well documented increase in tourism to the Isle of Skye and to Glendale has been observed by the Glendale Community Council and local residents. Concerns have led the Community Council members to undertake two significant pieces of work which highlight the pressures being faced by the area. An assessment of the volume of traffic and visitor numbers passing along the single track B884 Glendale Road (the only road into and out of the area) was recently carried out. Volunteers undertook two counts of vehicles entering and leaving Skinidin at the gateway to Glendale. The days were chosen when enough volunteers were available – 2 volunteers for a 2 hour time slot covering twelve hours each day. The traffic census recorded vehicle type, numbers and approximate number of passengers. Both days happened to be exceptionally wet and windy, with torrential rain and poor visibility on the second day. The results of the survey were staggering, especially as it was felt that given the poor weather conditions, there would be a limited demand from visitors to destinations such as Neist Point. A summary of the data collected is provided below. Using these figures as a basis, annual predictions for the volume of non-local traffic using the B884 to go in and out of Glendale are detailed below. The headline figures indicate that the number of non resident people travelling the road into and out of Glendale is estimated to be approx 650,000 per year with almost 300,000 additional (non local) vehicles travelling over the single track road. This huge volume of traffic and Highland Council’s inability to maintain roads due to continual cost saving exercises has left many road surfaces and verges in exceptionally poor condition. There are over 35 passing place signs missing along a relatively short section of the road, and with only 10 parking spaces available at Neist Point it appears to demonstrate that something must be delivered urgently to ensure visitors and locals can use the roads safely. This increase in visitors also highlighted the need for a report on public toilets in the area. There is currently no provision of public conveniences in Glendale, the closest being in Dunvegan over 12 miles from Neist Point and often over 40 minutes drive on a busy day. The impact on local business owners and residents was highlighted in the report which raised concerns dating back to the summer of 2016. A significant number of reports of human faeces were recorded (and in some cases documented in photographs by residents) at various locations, including, but not limited to, outside the Free Church of Scotland, the Glendale Community Hall, Meanish Pier, Neist Point and by the side of the main road throughout the area. 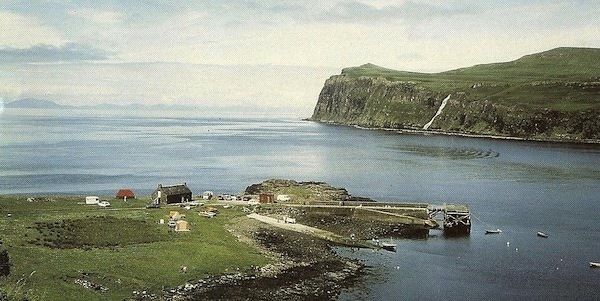 Motor home tourists were also seen emptying toilet tanks at locations such as Meanish Pier and Neist Point. The results of these reports has led the Community Council to urgently seek to develop a sustainable strategy and plan to alleviate the pressures on the area and in doing so ensure Glendale is well equipped and prepared for the forecast increase in visitor numbers in 2018 and beyond. A public meeting is scheduled to be held in the Red Roof Cafe, Holmisdale on Thursday 5th October at 19.00. Attendees will be asked if a solution to the issues should be led by the local community. If demonstrable and majority support is evident then options and ideas will be sought on what solutions should be considered and which stakeholders should be involved. Kate Forbes MSP pledged her support for the work of the Community Council: “The results of the survey conducted by Glendale Community Council quantify the impact on local residents this summer of the huge increase in visitors. “It’s no wonder that people want to visit the area, with its history, quality food and accommodation and, of course, the stunning scenery. “Tourism is a great opportunity for Glendale and the surrounding villages because it’s creating more economic opportunity than ever before, however I realise that there is a lot to do in advance of next season around roads and public conveniences.